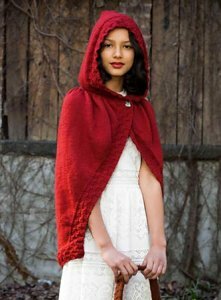 Taken from Once Upon a Knit: "This cozy cloak is a grown-up version of the classic Little Red Riding Hood cable but can sized to fit little girls as well." This pattern is from Once Upon a Knit, pg 10 - Ruby Red Riding Hood. Size US 7 - 32" circular needles (or size needed to obtain gauge), stitch markers, a tapestry needle, two 3/4" buttons and sewing needle and matching thread are required but not included. Finished Measurements: 62.5 (76.75)" width at shoulders, 24 (32)" length, 32 (36.75)" hem width after blocking. Gauge: 20 sts & 28 rows over 4". Color Shown is #016 Gypsy Red. $128.00 -- Kit price including yarn only (no book or pattern).